Here I go again using the orange boxed cake mix. My son gave me these delicious chocolate filled and covered figs. OMG , they are delicious. They are from a fancy candy maker named Frans. So I have had these candies since Mothers Day and have been nibbling on them but had a couple left. 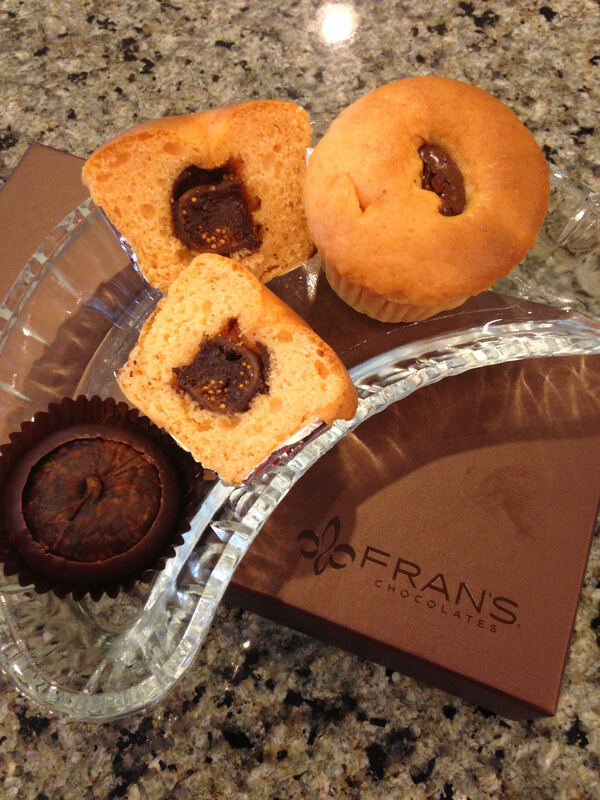 Today I cut the figs into four pieces and put one piece inside each cupcake. Bake them for 20 to 25 minutes. I will say,” OMG” again. You have orange cake, chocolate and then the fig. Serve with a cup of coffee and keep on smiling. Once again, never throw out any leftovers. I grilled some pizza dough and had one leftover. It was about a 1/2 pound of dough. I did not season it so it was the perfect pallet for anything. 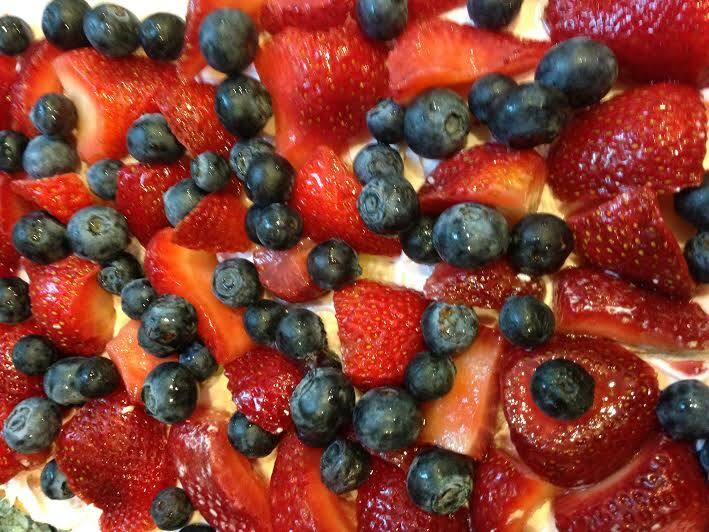 Since I had some leftover berries it was a great combination. Mix them all together and sprinkle about two tablespoons of sugar and about one tablespoon lemon juice together. Let this sit for a couple of minutes. Take the grilled pizza dough and spread either regular or strawberry cream cheese all over one side. I like it the thickness of a smear on a bagel but feel free to add more. Just before serving add the berries. Don’t add them before because the dough will soften. I cut it in pizza triangles and it was too good. Talk about a fabulous low calorie treat. This is it but be careful of a high calorie dipping sauce. This is the first time I used rice paper and it is a little tricky but not hard. Everything has to be prepared before you begin. Lay out the rice paper. I used carrots, celery, cucumbers, avocado, basil leaves, green onions, blanched green beans and raw spinach leaves. I will try shrimp with mixed Asian vegetables. Anything can be a filling but don’t fill it too much because you have to bite into it. Also make sure the filling is dry because it will melt the rice paper. Dip the rice paper in the water for about ten to 15 seconds. Place in the palm of your hand. Put the filling in the middle and fold the sides up than fold the ends in to make a roll. Place on a lettuce leaf because the rice paper is sticky and will stick to the plate. Serve with the carrot ginger dressing, Franks Chili sauce, Spicy vinegar, beau monde sauce or just plain soy sauce. 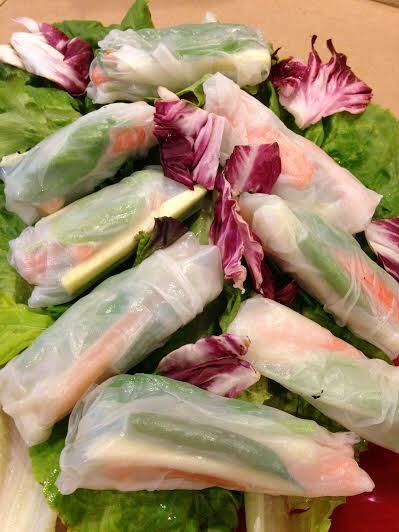 The rice paper gets hard if you make them a day ahead so try to make them fresh. I first saw these on Pinterest and have been reinventing the roll. Butter Yum is another website I follow and their stuff is fabulous. This is their basic recipe with two or three things changed. Two sticks of softened unsalted butter. Do not use margarine. One box of mini rolos or pom poms for the top of each cookie. You can use any chocolate covered caramel you like. 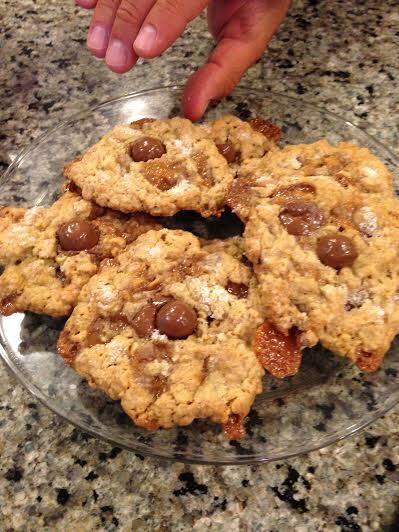 Use either parchment paper or a silpac or else you will never get these cookies off the pan. Add the rolo in the middle of the cookie and sprinkle with the salt. Place only eight to ten cookies on each pan because they spread. I baked my cookies at 350 degrees for 13 minutes and they were perfect. Do not over cook them. I am embarrassed to admit that I made two batches in two days. I needed a no fuss meal that could keep for several hours since everyone was coming home at different times. The first to arrive got the pasta fresh out of the oven. Everyone else gets the leftovers. They didn’t mind and I only had to cook once. 1 1/2 pounds of cooked macaroni. Assemble everything in a line. The tomato sauce, cooked macaroni, cooked sausage. ricotta cheese, mozzarella cheese, Romano cheese. Use a deep 9 x 12 baking pan. Layer with about two cups of tomato gravy, then half the macaroni, half the sausage, half the ricotta cheese, half the mozzarella and a good sprinkling of the Romano cheese. 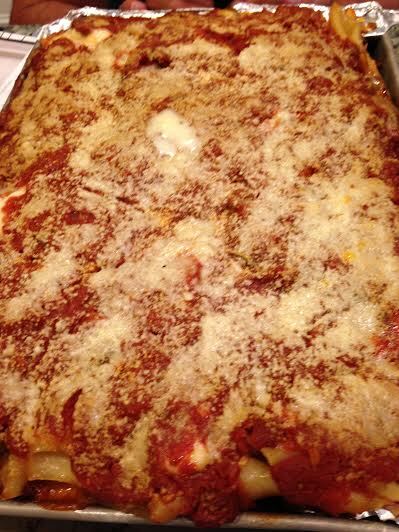 Continue with another layer of the same ending with the last of the gravy and more Romano cheese. Cover with foil and bake at 350 till bubbling hot about forty minutes. I served this with a big green salad with homemade garlic croutons.. This is a dark bread that I picked up at the South County Farmer Market. 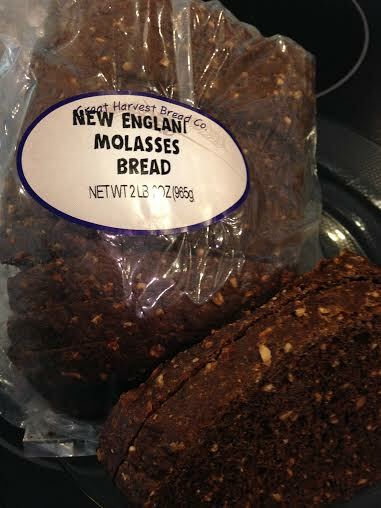 It is made by the Great Harvest Bread Company in R.I. It is a two pound loaf of grains, wheat, molasses, oats and honey. Tonight I am not cooking. Poor kid is allergic to milk. I try to keep finding desserts that he could eat. Remember the chocolate wafer cookie that your Mom made icebox cake from? Well they still sell them to the tune of $4.89 a box. I bit the bullet and bought them because it was for my grandson. 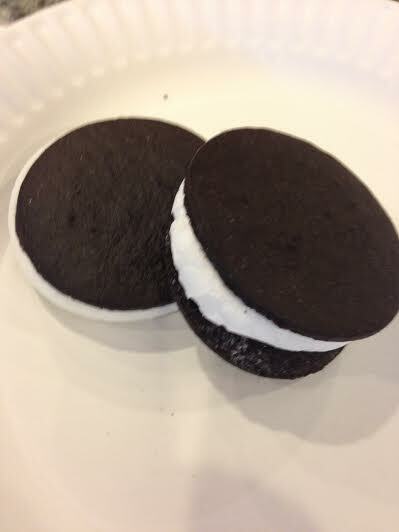 Take one wafer and put one marshmallow on top. Place in a microwave for 3o seconds or until the marshmallow starts to puff. Serve plain or with non dairy chocolate sauce for dipping. Everyone wanted at least two.